The Video Game Culture of Zombies – How Dead Rising 3 on Xbox One Kicks Off a New Generation of Mayhem took place on Saturday, July 20 at the San Diego Comic-Con 2013. The panel was moderated by Jessica Chobot. The panelists in attendance were Jeff Cork (Senior Editor, Game Informer), Josh Bridge (Executive Producer, Dead Rising 3), Allen Jarvie (Art Director, Dead Rising 3), Max Brooks (Author of The Zombie Survival Guide and World War Z: An Oral History of the Zombie War). Over the course of the panel the participants touched on their own zombie apocalypse survival plans, games that share common themes with the zombie genre, Dead Rising 3 and how it pushes the zombie genre ahead. Outrunning their children, because families in a zombie apocalypse have been shown to be a liability. Getting in one’s armored, picking up the previous panelist’s children, making sure they’re safe somewhere, making a stop at Costco and then heading for the hills with a sniper rifle. Max Brooks said he had been ready his whole life and simply didn’t know it. He told the audience that living in Southern California was preparation, and an earthquake kit was a zombie apocalypse survival kit. Cork was then asked where he saw the zombie genre heading. He felt it was headed towards the open-ended MMO. The panel moved to discussing Dead Rising 3 and what it’s doing to push the zombie genre along. According to the panelists, it has an open world, more zombies and the freedom to plan and explore as you want. All of the buildings are enterable. Your character will always be scavenging and looking for higher ground. In this game, the infection has been going on for years. A government agency, the Zombie Infection Control Unit (ZDC), has been chipping people who are infected. The chipping is later revealed to have a more nefarious intent behind it. Through the SmartGlass app, you’ll be able to receive calls from in-game characters as you play. You’ll also be able to call in air strikes with the touch of a button. According to the panelists, everything is a weapon. Makeshift weapons shown over the course of the panel included a homebrew flamethrower, an axe, a guitar, a laser sword and a sledgesaw. You can use light and sound to affect zombies. The zombies have increased awareness. You can trick, distract, avoid or lure them. When driving in the game, Zombies may latch onto your car. These zombies can affect the physics of your driving through their weight. 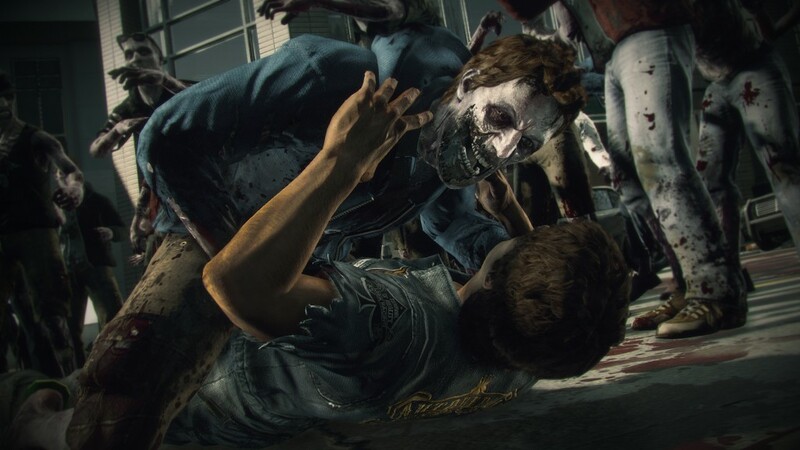 Some zombies in the game will still retain partial memory of their previous life. They might continue to attempt to carry out the last act of their living life. Firemen zombies may swing their axe at you. Former football players may try to tackle you. 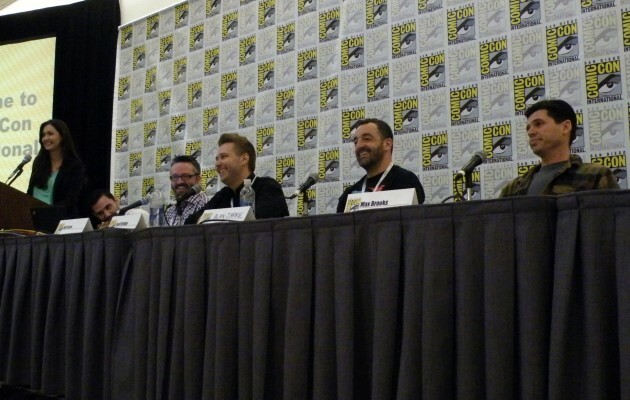 Other archetypes shown during the course of the panel included cop and prisoner zombies. Glass in the game is all physics based. When shattered, it will fly out and drape over whatever it lands upon, though it cannot hurt your character. Costumes and other elements allow you to play through the game seriously or with humor. Some costumes shown over the course of the panel were a knight’s armor and a banana hammock. All damage done to a zombie is location based. When players strike flesh, bone will begin to show through. Brain matter will peek through the skull when struck. Brooks was asked what he thought the next big thing in Zombie gaming would be. He told Chobot it would be multiplayer. He liked that Dead Rising 3 would allow friends to play on different sides of town, to use their SmartGlass app to set a meeting place and put maps on their smart phone. Josh Bridge thought that there was more growth potential and that film, books and games would continue to feed off of one another.